A novel imaging technique provides insights into the role of redox signaling and reactive oxygen species in the healthy and injured nervous system. The micrograph shows a peripheral nerve, with the neuromuscular endplates stained in red. The nerve-cell mitochondria were imaged with a fluorescent redox sensor (green in the cytoplasm, yellow at the endplates). Reactive oxygen species are important intracellular signaling molecules, but their mode of action is complex: In low concentrations they regulate key aspects of cellular function and behavior, while at high concentrations they can cause “oxidative stress”, which damages organelles, membranes and DNA. To analyze how redox signaling unfolds in single cells and organelles in real-time, an innovative optical microscopy technique has been developed jointly by the teams of LMU Professor Martin Kerschensteiner and TUM Professor Thomas Misgeld, both investigators of the Munich Cluster for Systems Neurology (SyNergy). The work is reported in the latest issue of Nature Medicine. “Our new optical approach allows us to visualize the redox state of important cellular organelles, mitochondria, in real time in living tissue” Kerschensteiner says. Mitochondria are the cell’s power plants, which convert nutrients into usable energy. In earlier studies, Kerschensteiner and Misgeld had obtained evidence that oxidative damage of mitochondria might contribute to the destruction of axons in inflammatory diseases such as multiple sclerosis. Kerschensteiner and Misgeld used redox-sensitive variants of the Green Fluorescent Protein (GFP) as visualization tools. “By combining these with other biosensors and vital dyes, we were able to establish an approach that permits us to simultaneously monitor redox signals together with mitochondrial calcium currents, as well as changes in the electrical potential and the proton (pH) gradient across the mitochondrial membrane,” says Thomas Misgeld. The researchers have applied the technique to two experimental models, and have arrived at some unexpected insights. On the one hand, they have been able, for the first time, to study redox signal induction in response to neural damage – in this case, spinal cord injury – in the mammalian nervous system. The observations revealed that severance of an axon results in a wave of oxidation of the mitochondria, which begins at the site of damage and is propagated along the fiber. 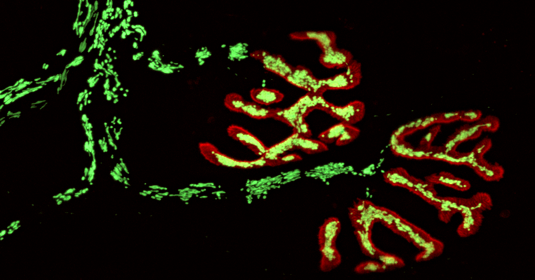 Furthermore, an influx of calcium at the site of axonal resection was shown to be essential for the ensuing functional damage to mitochondria.